Alberta has a wealth of imaginative and environmentally sensitive people. The amount of Solar systems installed in the province is on the rise. How can we encourage even more micro-generation investment in the province? We believe in paying micro-generators a reasonable price for the surplus green electricity they produce and ship back to the grid. 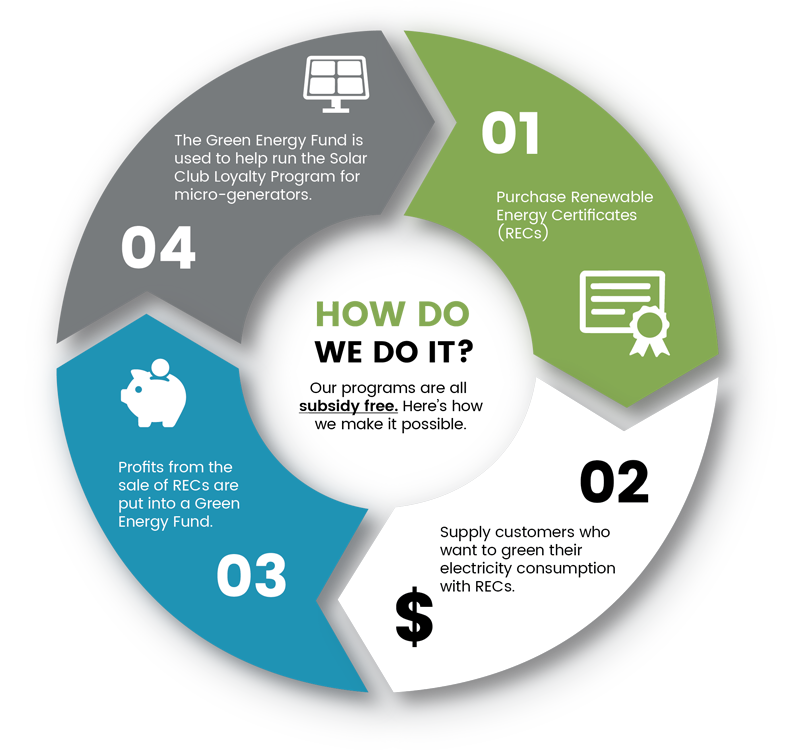 To encourage more Albertans to invest in solar systems we have introduced the Solar Club Loyalty Program. The program was designed specifically to help solar micro-generators earn a premium on their solar electricity and help further green Alberta's electricity grid. To qualify for all of benefits included in this solar club package, you must be a micro-generator in Alberta and make a donation to your local foodbank. Switch between a High Export Rate and Low Export Rate with just 10 days notice to accomodate seasonal generation fluctuations. Help the province realize its goal of 30% renewable energy by 2030. We will offset 30% of the electricity you import from the grid, FREE! Electricity rates designed seasonally for solar micro-generators of all sizes. Solar Club members can switch between these two rates at any time with just 10 days notice, penalty free to accomodate seasonal generation fluctuations. *Designed for solar micro-generators exporting more electricity to the grid than they are importing. *Designed for solar micro-generators importing more electricity from the grid than they are exporting. To join the Solar Club Loyalty Program you must be signed up as a customer of one of the participating local Energy Marketers in our network. The Light Up Alberta Solar Club is a non-government program created to help increase the earning potential of micro-generators. It was designed for residential, farm, and small commercial customers who are both importing and exporting electricity to the grid.